All of us want to be loved, but bloggers are happy to be liked, too. “Love” is something that we feel when somebody not only “likes” our posts, but shares them. Michael Turner truly loves us here at Proverbial Thought. Mr. Turner has been following Proverbial Thought, along with my other blog, The Recovering Legalist, for a good while. More often than not I will see how he has forwarded our posts on Twitter. Michael Turner describes himself as a “Christ Follower, Husband, Dad, Grandpop, Blogger, Musician, Ripley TV-19 Football & Basketball Announcer for Ripley High School.” Well, he can now add recipient of new book to his bio. MICHAEL TURNER POSTED OUR 1,000th LIKE! 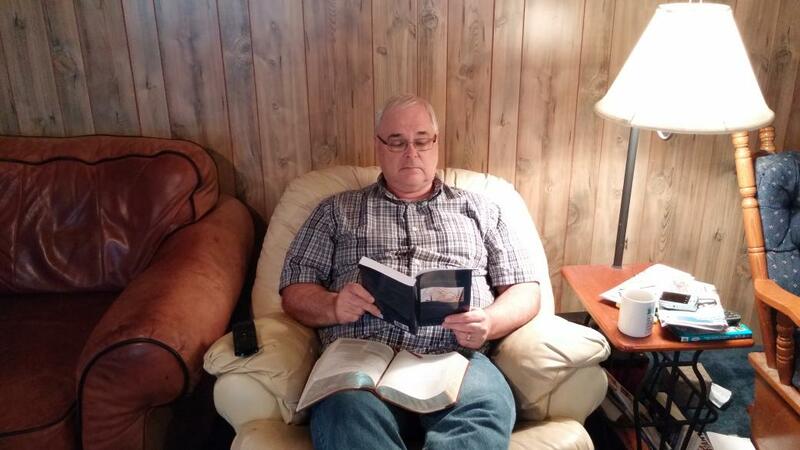 So, here is our “liker,” Michael, using his new book as part of his daily devotions. We are honored. Maybe we can do something special for our 1,500th? This entry was posted on Tuesday, May 12th, 2015 at 10:56 am	and tagged with blogging, books, likes, Michael Turner, Ripley High School, winners and posted in blessing. You can follow any responses to this entry through the RSS 2.0 feed. Thanks again for the book Anthony. I am enjoying reading a different thought each day as my devotion. It is truly interesting the perspective each individual writer brings to Proverbs. I hope and pray that each of you keep up the good work! To all the other readers of this blog, click on the book at the right side of the page and get one of these for yourself.